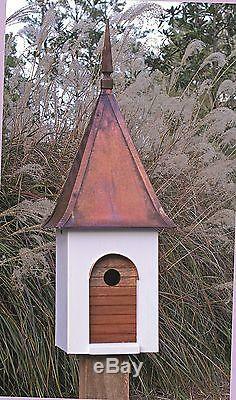 Heartwood French Villa 29 in x 11 in x 11 in Birdhouse. Overlaid solid copper roof with cast iron finial tops. Hand oiled mahogany door with copper doorway molding add a distinctive touch. Clean outs, ventilation and drainage built in. Hand crafted in the USA. Clean out hole covered by copper cover plate. Product Type: Birdhouse/Wren House/Swallow House/Bluebird House. Country of Manufacture: United States. Overall Height - Top to Bottom: 29. Overall Width - Side to Side: 11. Overall Depth - Front to Back: 11. Overall Product Weight: 12 lbs. The item "Heartwood French Villa 29 in x 11 in x 11 in Birdhouse" is in sale since Friday, March 04, 2016. This item is in the category "Home & Garden\Yard, Garden & Outdoor Living\Bird & Wildlife Accessories\Birdhouses". The seller is "wayfair" and is located in Star, Mississippi. This item can be shipped to United States, Canada, United Kingdom, Denmark, Romania, Slovakia, Bulgaria, Czech republic, Finland, Hungary, Latvia, Lithuania, Malta, Estonia, Australia, Greece, Portugal, Cyprus, Slovenia, Japan, China, Sweden, South Korea, Indonesia, Taiwan, South africa, Thailand, Belgium, France, Hong Kong, Ireland, Netherlands, Poland, Spain, Italy, Germany, Austria, Russian federation, Israel, Mexico, New Zealand, Philippines, Singapore, Switzerland, Norway, Saudi arabia, Ukraine, United arab emirates, Qatar, Kuwait, Bahrain, Croatia, Malaysia, Brazil, Chile, Colombia, Costa rica, Panama, Trinidad and tobago, Guatemala, Honduras, Jamaica, Antigua and barbuda, Aruba, Belize, Dominica, Grenada, Saint kitts and nevis, Saint lucia, Montserrat, Turks and caicos islands, Barbados, Bangladesh, Bermuda, Brunei darussalam, Bolivia, Ecuador, Egypt, French guiana, Guernsey, Gibraltar, Guadeloupe, Iceland, Jersey, Jordan, Cambodia, Cayman islands, Liechtenstein, Sri lanka, Luxembourg, Monaco, Macao, Martinique, Maldives, Nicaragua, Oman, Peru, Pakistan, Paraguay, Reunion.